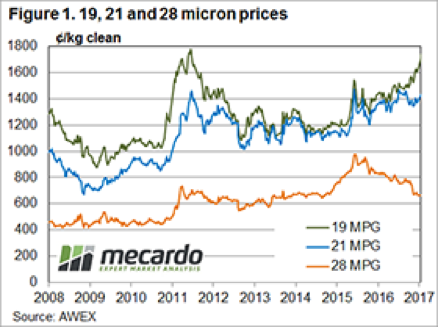 The response from three wool brokers this week when asked about the wool market was unanimous – it’s extremely good if you have wool 19 micron and finer, its good if you are in the “bread and butter” 20 to 22 micron range, and it’s terrible if you have crossbred types. This reinforces the concept that the wool market is not homogenous, it’s made up of a variety different markets. There were some proviso’s on the above comment; the increasing number of lots containing higher levels of vegetable matter and burr are starting to be left behind, with buyers preferencing the good “FNF” (free or nearly free) types. This is a normal response as more wool with fault comes forward at this time of the year. The good season with excess growth of grass and burr’s is a factor; we note that it is usually more extreme when wool prices are high. The general market showed a lift of 10 cents in A$, and with a weaker US$ the EMI lifted 22 cents in US$ terms. 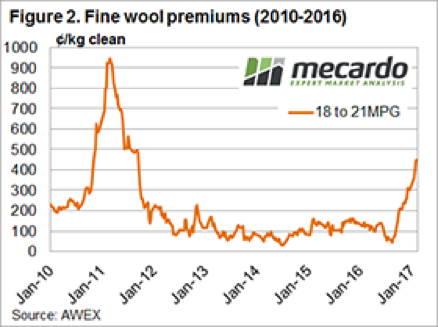 This should see the fine wool prices continue to lead the market, supporting the other merino microns (a repayment of recent times when the medium wool supported fine wool prices). The concern about supply of fine and superfine wool is not simply about wool producers having taken breeding decisions based on the disappointing prices of recent times; the terrific season across most wool growing areas means that each flock will test broader this season. Next week an offering of 45,861 bales at all centres is rostered, its hard to see that there is not more of the same coming with wool producers (except for cross-bred types) happy to take full advantage of a buoyant market.